This morning, I woke up to the sound of birds chirping in our garden. Not just any birds, but blackbirds making sounds of spring. So this seems a perfect day to tell you guys about a new product, the –Hanaya- Spring Garden Collection. The collection, brand new for 2015, is 100% mesh and has a low land impact. 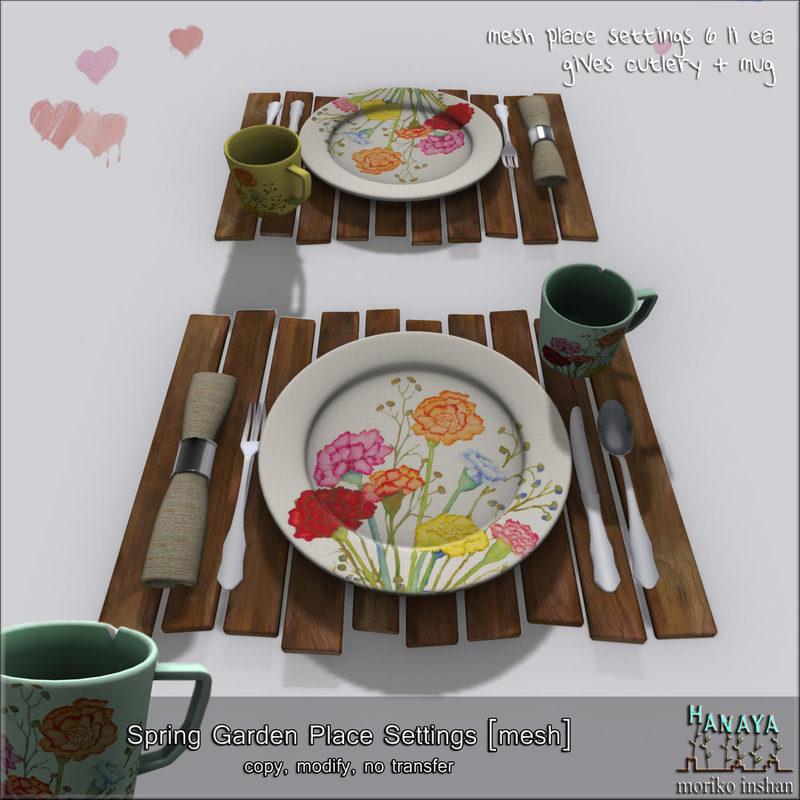 The Spring Garden Dining Set consists of a glass table, chairs, matching place settings and a vase with carnations. The set is also available as separate components. 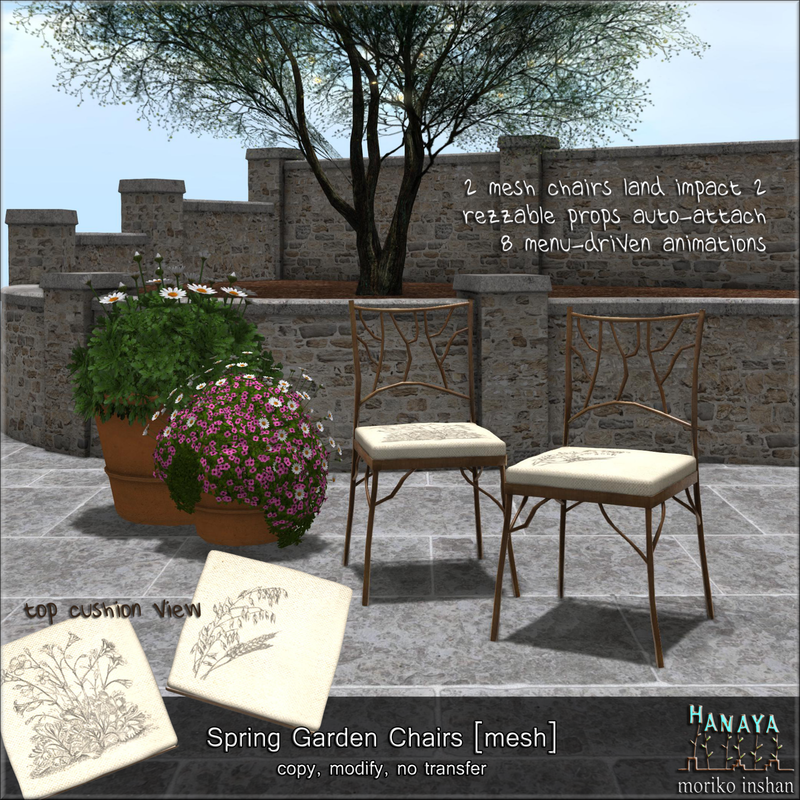 The Spring Garden Chairs have 2 types of upholstery, weigh in at a land impact of 2 PE and have 8 menu-driven animations (chat, eat, drink and full tummy for girls and guys). 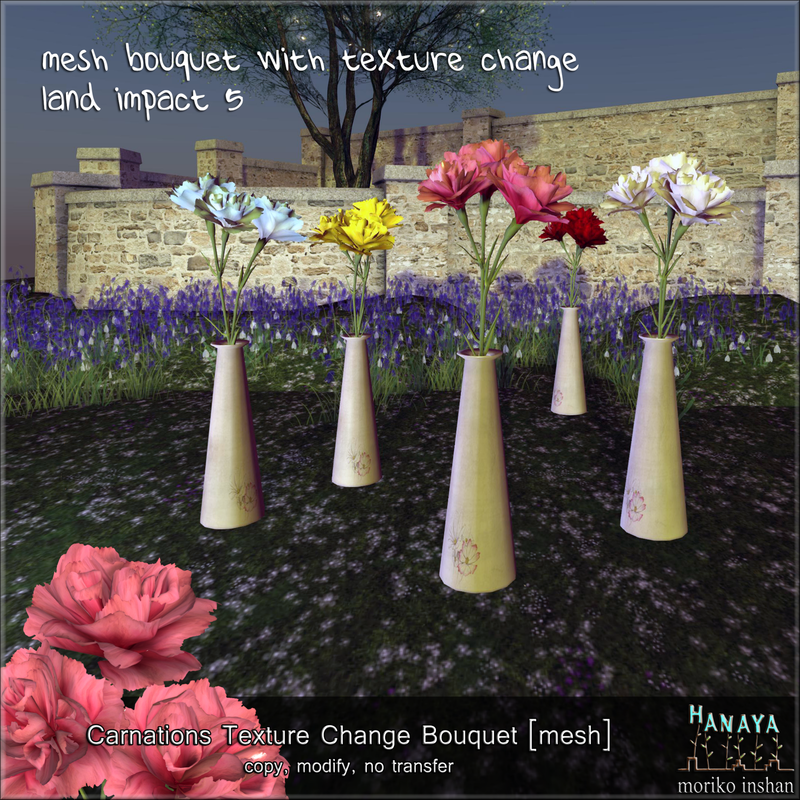 Some of the animations offer attachable mesh props when given permission. 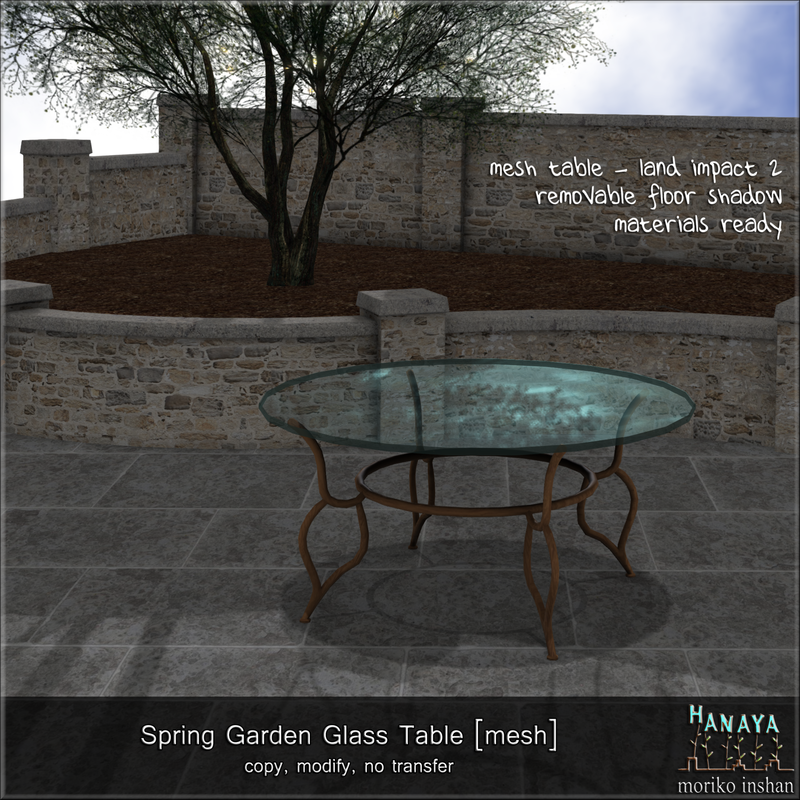 We thought that a glass topped table would fit well with the lightness of spring. The -Hanaya- Spring Garden Glass Table is 2 li, and is sized for 4 avatars to sit at it. It can be scaled down a bit, if you want to use it as a display table. 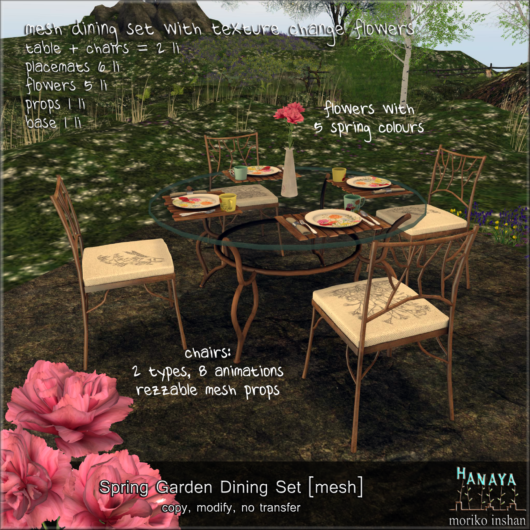 The casual look of the -Hanaya- Spring Garden Place Settings fits in with my idea of breakfast or lunch outside in the garden. If you click the placemat, you and your friends will receive a folder with cutlery and mugs. The collection includes a vase with a trio of carnations in 5 spring colours that match the other components. 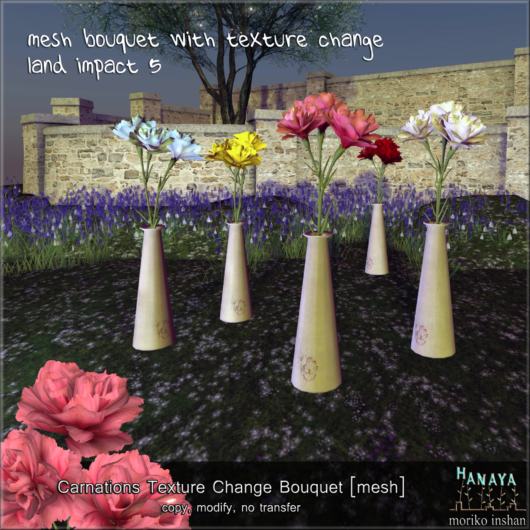 Simply touch the vase to pop up the texture change menu for a bit of variety. The -Hanaya- Spring Garden Collection is available on the Second Life Marketplace as well as our in-world store, where it is on display. For members of our store VIP group, the normal 20% discount is applicable when you have the group active. This entry was posted in Product Announcements and tagged spring on March 4, 2015 by moriko.